This 2917 square foot house is a must-see for anyone interested in design and architecture. 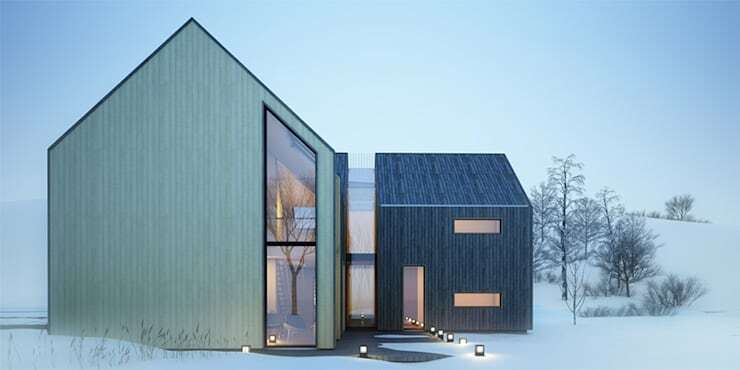 Designed by architects MAJCHRZAK PRACOWNIA PROJEKTOWA, this home is a modern and contemporary structure that is functional and spacious, yet not too big. In fact the designers have gone out of their way to ensure that this home isn't TOO big so that parts of the home don't get under-used or wasted. Perfect for a small family and takes on a block design with a modern gable roof finish. It is in the shape of a 'T' and is slotted on a very large property. Large glazed windows and doors insulate the interior space, while allowing for panoramic views of the surrounds. We will also explore the architectural plans of this dynamic design and see how the designers have created a flow between interior and exterior spaces as well as open plan spaces and more private, closed spaces. Every detail has been carefully considered and today on homify, you get to explore exactly how for yourself! In this image, we can see the 'T' shape for ourselves. The facade features beautiful warm wood and an abundance of glazed glass, which creates that transition between interior and exterior spaces. 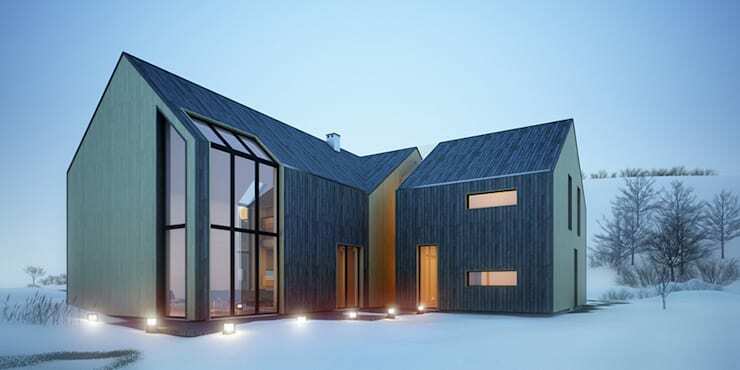 The clean lines of the architecture and the sleek gable roof are very contemporary and aesthetically appealing. From this angle, we can see how the architectural structure is made up of different volumes and shapes, which creates a stunning look and feel. Don't you love the interspersing of glass throughout the facade? We can also see on this side how different shades of wood makes for a striking contrast between tones and colours. 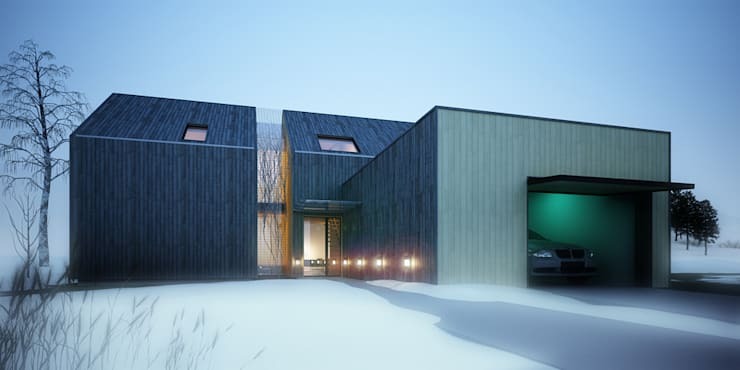 Do you see how lighting has been used to enhance the details of the exterior design? We all know how important a garage is, keeping the car out of the cold, snow, wind, rain or harsh sunlight. 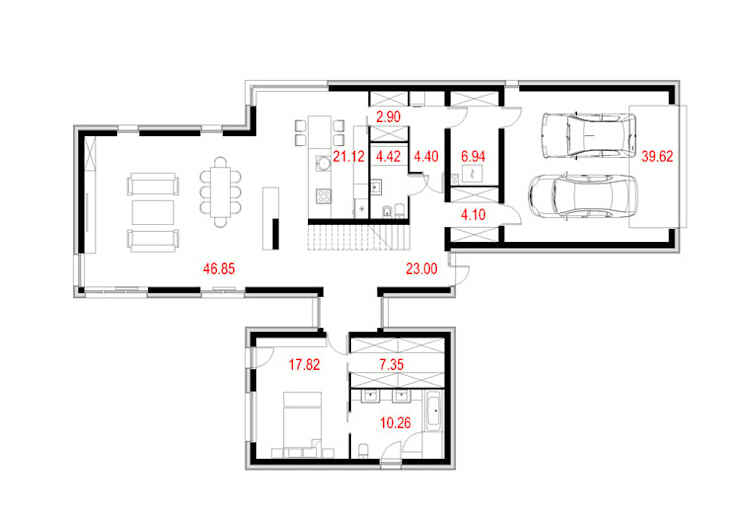 This garage fits snugly into the corner of the house, with easy access into the home itself. This is a very simple and modern garage design, but there are so many ways to enhance your facade with this functional element. Here we can see how a narrow wooden terrace creates a pathway around the house, which is very beneficial. It ensures that the garden doesn't get ruined in summer or that people slip in the snow in winter. We can also see just how voluminous the gable roof is, making for a very grand design. Here we can see what the home looks like when it is not snowing. 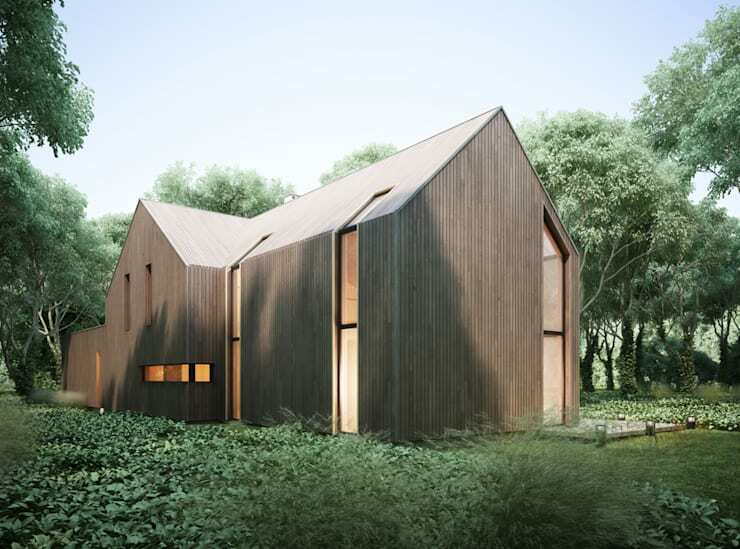 The warm wooden facade creates a home that integrates flawlessly with the surrounding landscape. Wood is always a wonderful material as it is durable, cost-effective, suits any style and looks stunning! Have a look at this article for more inspiration: Woodworking: 10 projects that will make you yell wow! 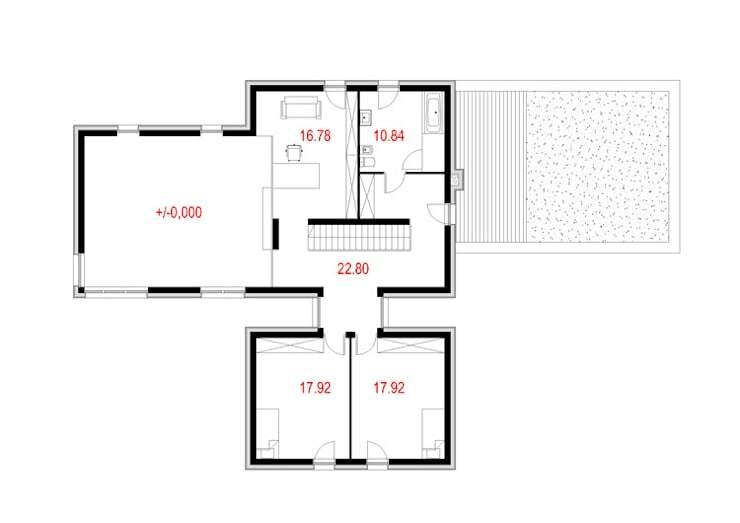 Here we can see the architectural plan of the ground floor. We can see how functional the double garage is as well as how the home features open plan spaces as well as more private, closed spaces. The living areas flow between one another, making for an engaging and social environment that is perfect for a small family. The more private areas allow the family members to relax without being on top of one another too! Do you see the 'T' shape distinctly here? Here we can see the upstairs section of the home with its bedrooms and bathroom. Do you see how carefully every detail is considered and planned for? 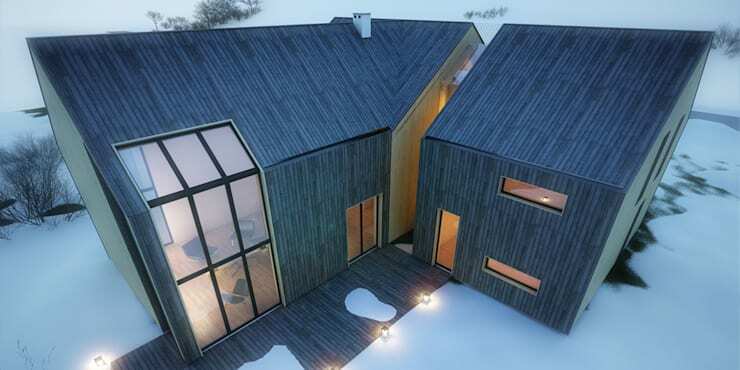 If you've enjoyed exploring this home, you'll love the super 7 wooden houses. Did you enjoy exploring this house?